Architecture, design and location are helping define the UK’s path in scientific research writes Jennifer DiMambro. Architecture and building design play a key role in defining a country’s mentality and intention; just look at impressive London icons such as 30 St Mary Axe (The Gherkin) and The Leadenhall Building. Both buildings reinforce the perception of London as a major global financial centre, drawing talented professionals to the UK – so why should we not take the same approach to scientific research facilities? Attractive facilities, which encourage collaboration and the sharing of ideas, and provide access to the latest equipment, are key considerations for professionals at the top of their game. Through creating environments that inspire and support researchers, we can attract talent and achieve the results that will keep the UK on the world research map. Aspirational, state-of-the-art environments can encourage the world’s leading scientists and researchers to work in the UK and inspire school and university leavers to pursue careers in this sector. As part of this drive to boost the attractiveness of scientific research facilities, science is moving more and more towards our cities. Buildings that would once have been located on the edge of a city or on a campus, set back from busy streets, are now being positioned in vibrant, urban neighbourhoods. International pharmaceutical giant Pfizer for example, once based primarily in Sandwich, Kent, now has a significant portion of its research activities in Cambridge, which forms a point of the “Golden Triangle” of scientific research between Oxford and London. Like many professionals, scientists enjoy working in vibrant, urban environments. Better transport links, as well as access to a range of social and cultural activities, all play a vital role in attracting top talent. Indeed, positioning scientific research centres in influential locations, just like financial districts and grand city buildings, can play a significant role in raising awareness of the importance of science and engineering. Over the last few years, a number of new scientific and medical centres have opened in city centres across the UK that showcase the importance of architecture, design and location within science and engineering. Notwithstanding the aesthetic appeal and 21st Century engineering designs, these new facilities also reach new heights in terms of technical innovation. Just like the research undertaken inside seeks to break boundaries, these buildings aim to challenge accepted norms - in engineering and architectural design, and location. Whereas historically we have designed buildings to meet specific research requirements, now there is an increasing focus on creating multi-functional and flexible work spaces. This approach allows buildings to respond and adapt to change, providing a longer lifespan and improving sustainability credentials as a result. This is a design ethos that takes the function of the building into consideration, and is one we now apply to the majority of projects, including the new Cancer Centre at Guy’s Hospital in central London. 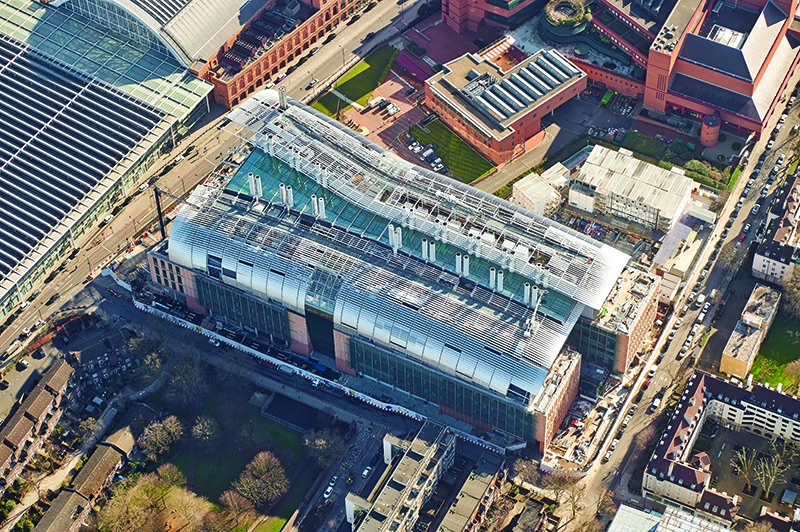 Set to open in September this year, the Crick Institute, situated in the prestigious St Pancras area, will become the latest facility to join central London’s burgeoning research community. On completion, the facility will become Europe’s largest biomedical research centre, housing 1,500 scientists working on disease diagnosis, prevention and treatments for conditions including cancer, malaria and influenza. "In an area with a historically dense population and where local housing is in short supply, it was particularly important that the facility gave something back to the local community." Positioned amid a cluster of academic, scientific and medical organisations, the facility’s location is viewed as critical to its success in attracting the best research talent and establishing the institute as a world-respected medical destination. As we have observed in the hi-tech sector, with the formation of industry hubs such as Silicon Valley and Tech City, being in close proximity to peers can be hugely beneficial. The opportunity this affords for the cross-pollination of ideas is a huge draw for ambitious individuals, who would like to work in an environment that will nurture their skills. In addition, the nearby St Pancras International and King’s Cross railway stations provide excellent local, national and international transport links for visitors and guest lecturers, as well as easy access to other national research organisations, such as the Sainsbury Laboratory, which can be reached within 45 minutes. While the Crick Institute benefits from its location, the relationship is mutual. The institute has worked closely with Camden Council to agree a package of benefits for the local community, including a facility, called the Living Centre, to promote healthier lifestyles. In an area with a historically dense population and where local housing is in short supply, it was particularly important that the facility gave something back to the local community. The Sainsbury Wellcome Centre (SWC) is another prime example of these emerging science facilities – both in terms of location and design innovation. 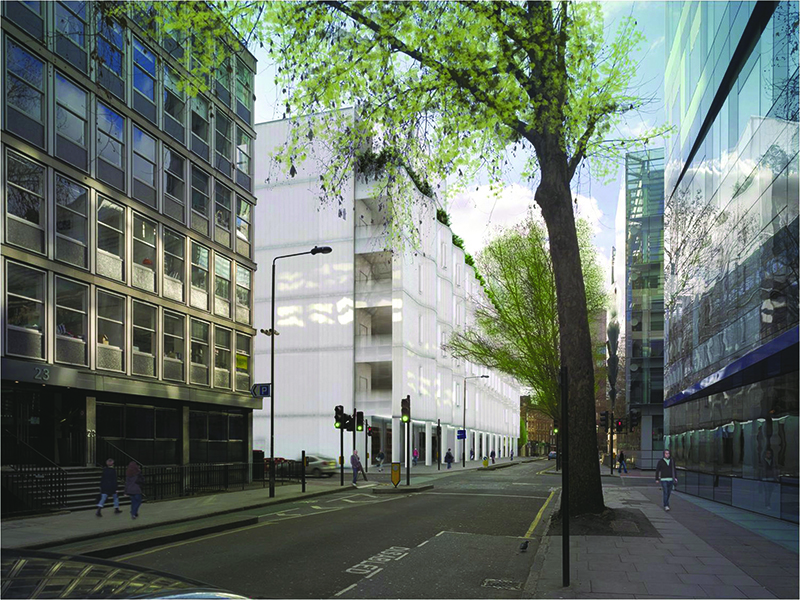 Based on the corner of Charlotte Street in central London, the building sits at the heart of the University College London campus, in close proximity to other scientific facilities and city amenities. "Like many other new facilities, the new Cancer Centre at Guy’s Hospital in London has been designed with longevity in mind." The SWC will be the first new-build lab in the UK to include an Aircuity system, which takes samples of air remotely throughout the facility and routes them to a centralised suite of sensors. By measuring these against critical indoor environmental parameters, the system can tailor ventilation in real-time to the requirements of the facility, ensuring optimum energy efficiency while ensuring the health of those working in the laboratories is not compromised. 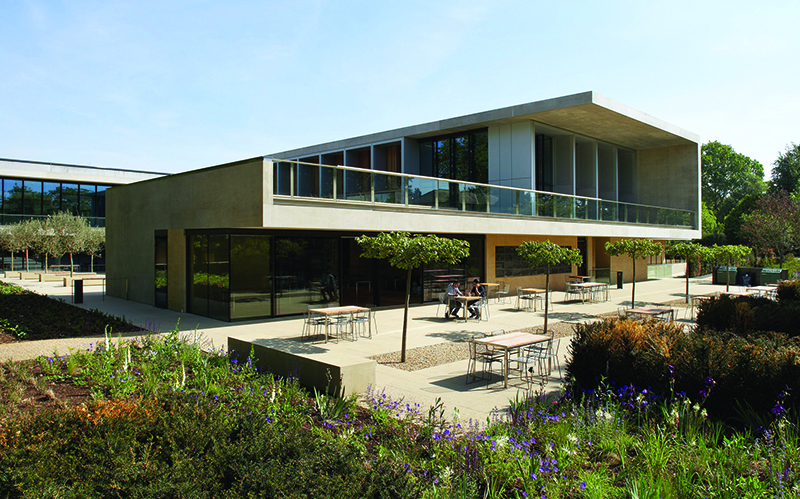 Similar to SWC, The Sainsbury Laboratory in Cambridge has been designed to make the most of its location. The 11,000m2 plant science research facility sits within the University of Cambridge’s Botanic Gardens in central Cambridge, and has been designed to house complex scientific research within a building that responds to this environment. The laboratory inspires its 120 researchers by providing an unprecedented level of natural light and proximity to their subject, including daylight from rooflights as well as windows overlooking the Garden. Although the majority of the building is private, the café is open to the public; the intention being to create interest in the research activity taking place inside. For example, a screen provides visitors with insight into the building energy consumption and performance of the photovoltaic array. The auditorium in the lab also holds public talks, as well as academic symposia. Like many other new facilities, the new Cancer Centre at Guy’s Hospital in London has been designed with longevity in mind. With healthcare evolving at a rapid rate, future-proofing the facility and ensuring that it can continue to house the latest innovations in healthcare - and attract those able to deliver - has been a key aspect in its design. The demountable LINAC bunker shielding, for example, allows for this area to be re-designed in the future should less invasive cancer treatment be available. Meanwhile, the flexible building services strategy allows for any floor to be re-fitted, while the adjacent floors remain fully functional. While all of the medical and research facilities discussed sit in city locations, none of these buildings make the architectural or aesthetic compromises you might expect from a new build in a confined, highly regulated urban area. Indeed, the high profile and visibility of these institutions has actually increased pressure on design and engineering teams to develop buildings which marry architectural vision with scientific requirements. Although these can be technically difficult to achieve, the impact of architecturally strong spaces is significant. These spaces encourage researchers to join an institute by providing a more stimulating and inspiring environment once they are working. It is these buildings that will bring science to our cities, and place London and other UK cities on the world research map.